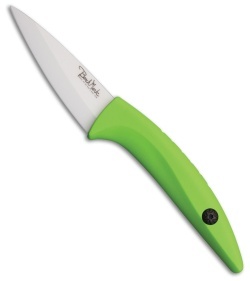 The Benchmark Ceramic Paring knife a must have for any kitchen for those small to medium size cutting chores. 4" white zirconium oxide ceramic drop point for excellent edge retention. Comfortable lime green rubber handle for a lightweight and secure grip. Hand washable with warm soapy water.